The dates of their reception would be known soon. Sabbir Rahman, the talented Bangladesh right-handed batsman, has been controversies’ own son and hence, his career has been a roller-coaster ride. However, despite all the commotions, the 27-year-old cricketer is expected to be a vital cog in the Tigers’ setup for the upcoming World Cup in England and Wales, scheduled to get underway on Thursday, May 30. His career has shaped out in such an extent that he has been labelled as a ‘bad boy’ of cricket. Recently, he got married to a girl named ‘Arpa’ at his residence. It was a completely private affair and was conducted in the presence of their family members. It has been learned that the bride is a student of HSC second-year and the couple will have a grand reception soon. 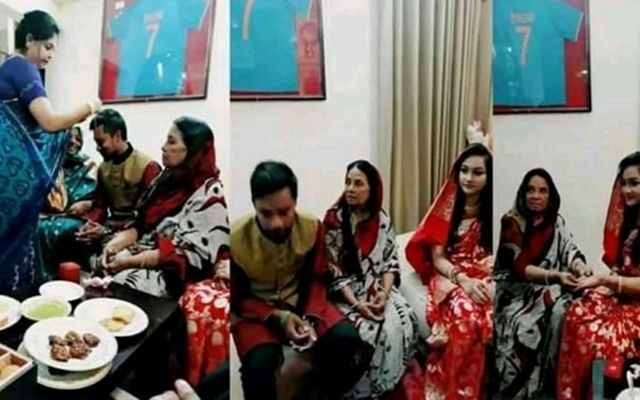 The Rajshahi-born Sabbir mentioned that everyone would be made aware of the dates of reception very soon. “I will let it known to everyone one my reception date is fixed,” Sabbir was quoted as saying to the reporters. Back in September 2018, the Bangladesh Cricket Board (BCB) meted out a six-month suspension to Sabbir for some off-field issues. He was also slapped with a fine of Tk 20 lakhs. As per the sanction, his ban was scheduled to end on February 28. However, to everyone’s surprise, he was included in the national squad for the three-match ODI series against New Zealand. In the series, he didn’t disappoint and churned out a stupendous century at the University Oval in Dunedin. It was his maiden ODI century, albeit it came in a losing cause. Sabbir was exceptional for the Sylhet Sixers in the Bangladesh Premier League (BPL) and reports did the rounds that the ban was reduced on the insistence of Mashrafe Mortaza, Bangladesh’s ODI captain. Bangladesh led the ever so experienced by Mortaza, will now play in the World Cup after their full-fledged tour of New Zealand. Their opening match is against the mighty South Africans at the Kennington Oval in London on Sunday, June 2.